We offer specialist flooring services for items such as gantry lifts, cherry picking baskets and industrial platforms where a combination of durable non-slip surfacing and/or noise deadening is required. In particular we offer Flowcrete, a wet pour 2 pack epoxy liquid coating as well as Polydeck, a pre-formed composite board that is screwed in place. Flowcrete is available in a range of colours and surface textures, can be applied in thicknesses up to 8mm and is self levelling & smoothing. The Flowcrete range of flooring finishes are hard wearing, abrasion resistant, chemically resistant and require minimal maintenance. A datasheet for the Flowcrete range can be found here. Polydeck is a GRP (glass reinforced polyester) sheet coated with a "near diamond hard" aggregate to provide a hard wearing anti-slip surface. 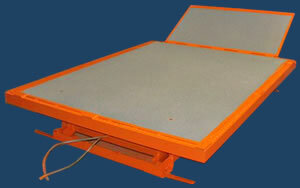 We fit this board product to structures such as gantry lifts and industrial mezanine systems to customer specification. The sheets are available as standard flat sheets in 2mm, 4mm or heavy duty 6mm and are designed to be mechanically fixed over virtually any structurally sound and level substrate including wood, concrete, steel, chequer-plate and open grating. Standard colous include black, yellow, grey, red, blue, green and brown and are available in 2440mm x 1220mm sheets which can be interlocked to create larger sheet sizes.